Has it really been 20 years since Home Improvement debuted on ABC? It appears so, as ABC is now releasing the 20th Anniversary Complete Collection of the hit sitcom that starred Tim Allen. The show was a success because a lot of families liked to watch the improvements that could be made to their homes with Value Home Improvement. 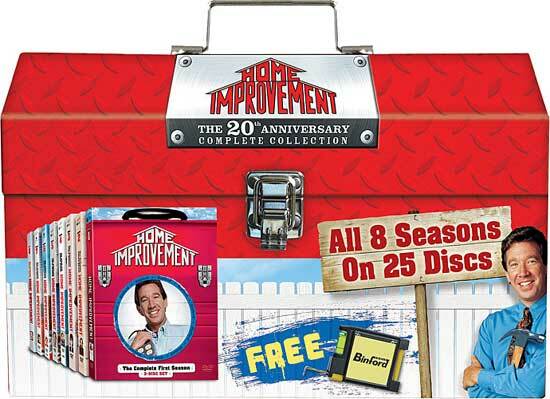 The set will come in a premium toolbox package with a Binford all-in-one tool that comes with all 8 seasons. The 20th Anniversary Complete Collection will hit shelves on May 10th with the small retail price of $129.99. As I was growing up I used to watch this, now that I have more knowledge of the home improvement trade I’d love to see this again..